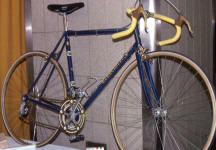 In 1954, Paulo & Italo Guerciotti established a small store outside Milan. Both brothers raced; Italo was a roadie, riding in the 1959 and 1960 World Championships. Paulo was an accomplished cyclocross racer who represented Italy in the 1979 'Worlds'. They used various builders to construct their frames, including Galmozzi, and uncle Lino Tempesta. In 1980, Antonio Mondonico became a partner & production manager. 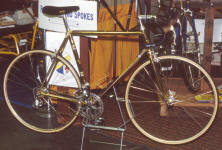 Jack Bissell's early 1970s "Guerc"
A very clean, original SL frame set.